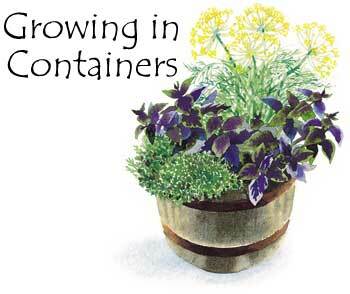 Container plants have only the soil in their pots to draw on for water. 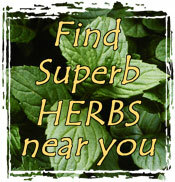 They require more frequent watering than garden plants. Some will need to be watered every day; others will want to dry out somewhat before being watered. For the latter, see that the surface of the soil has dried, then you can check the moisture level by pushing your finger an inch into the soil to feel the level of moisture. If it's dry an inch down, it's time to water. Lighter soil mixes will dry out more quickly than heavier ones. If you see the soil is not absorbing water and is running right through the pot, let them sit in a tub of water for an extended period of time to let the soil absorb the water. If this does not solve the problem, you may want to repot into a larger container. During hot, dry, windy weather, actively growing plants may need to be watered several times a day. The best time of day to begin watering is very early in the morning before the wind stirs and the temperatures rise. Many people believe that watering in the evening is best, but you run the risk of perpetuating fungal diseases when plants retain moisture all night long. If temperatures remain high at night, an evening watering is a good idea, but when they dip several degrees, cool, wet conditions may pose a problem. Don't rely on rain to provide enough moisture. Do the finger test to see if plants received ample rainfall, and don't forget to water plants you have under eaves or overhangs, even in rainy weather. Chances are, they are protected from the rain, and if no rainfall reaches them, they will suffer from drought. How much water is enough? Water until you see water coming out of the drainage holes. If water is not draining, your soil may be too heavy. Check to see that the drainage hole in not blocked. Repot if necessary. If the weather is rainy day after day, do not let your plants sit in a saucer full of water because eventually, this will cause them to drown and roots will rot. If your pots are drying out too quickly, you can mulch pots as well as gardens. Also, consider growing ground covers in the potscreeping thymes, chickweed, any low growing plant will do. These act as natural mulches, which will retain water and moderate soil temperatures. If you are going away for a few days and can't find a plant sitter, you can buy special nylon wicks or make your own. Make them from thin cotton clothesline. Push one end 1 to 2 inches into soil in the pot; put the other end into a wide, water-filled reservoir. Soaker hoses on a timing system work well, too.